After 60 years of blacklisting, the movie they still don't want us to see. Pulls together the history, culture and politics of New Mexico in a dramatic and inspiring story. The movie depicts the McCarthy Era strike by zinc miners in southern New Mexico and the struggle of women to achieve equality. 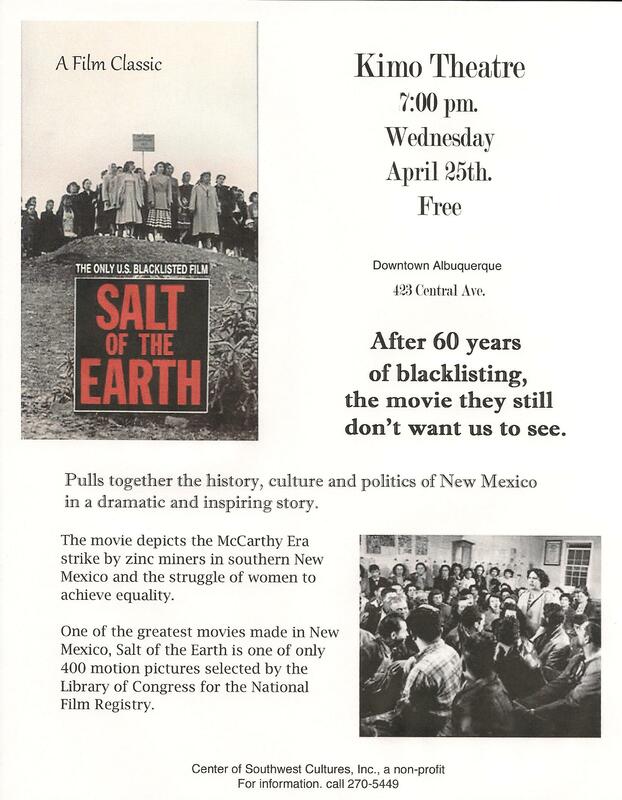 One of the greatest movies made in New Mexico, Salt of the Earth is on of only 400 motion pictures selected by the Library of Congress for the National Film Registry. Please join the Progressive Voters Alliance of Central New Mexico for this very special event! The following is a statement from the Chairman of the Democratic Party of New Mexico, Javier M. Gonzales, in reaction to a casting call issued by Governor Susana Martinez's Tourism Board that asks for "Caucasians and Light-Skinned Hispanics Only." "Leaders understand they have immense power to set the standard for what is acceptable, what is important, what is right or wrong. They also set the tone for who we are and what we are proud of as a people. In other words, they lead by example. The message Governor Martinez is sending here is not just that she doesn't want Hispanics to visit the state - although that alone would be bad enough. It's that she doesn't believe the state should be proud of our incredible Hispanic cultural heritage. It's that our Hispanic culture isn't worthy of being put front and center. That's sad, and it's inexplicable coming from anyone purporting to represent the people of New Mexico. But it's even stranger coming from the first Hispanic woman ever elected Governor in New Mexico. Today she does not speak for me, and she does not speak for the vast majority of Hispanics in New Mexico. I'm appalled, and Gov. Martinez should be embarrassed. She should apologize, retract this insulting casting call, and open up any advertising that she uses taxpayer dollars for to actors that truly represent the full spectrum of incredible diversity we have in New Mexico." Senator George K. Munoz, District 4, has worked diligently to bring more job opportunities for the people in his district. On March 12th, Sen. Munoz was proud to announce that the film industry will be giving the greater Gallup area more attention. Sen. Munoz says that in the past, movie stars such John Wayne and Ronald Reagan were familiar faces as they filmed in the Gallup area. Sen. Munoz envisions modern day stars walking the streets of Gallup with the heightened level of film activity in the community. Atomic Mom, an award-winning feature length documentary from M.T. Silvia, will screen on Saturday, August 27th, at 4:00 PM at the Allen Theatres Cineport 10 at 500 South Telshor Blvd. in Las Cruces, NM in the White Sands International Film Festival. Atomic Mom weaves an intimate portrait of a complex mother-daughter relationship within an obscure -– but important –- moment in American history. As the only female scientist present during atomic detonations in the Nevada desert, Pauline Silvia, the filmmaker’s mother, undergoes a crisis of conscience. After a long silence and prompted by her daughter, she finally reveals grim secrets of working in the U.S. atomic testing program. In our present moment of Wikileaks, Pauline is a similar whistle-blower having been cowed by the silencing machine of the US military for decades. In an attempt to reconcile with her own mother’s past, her daughter, filmmaker M.T. Silvia, meets Emiko Okada, a Hiroshima survivor trying to reconcile her own history in Japan. The film follows these survivors, each on a different end of atomic warfare, as they “meet” through the filmmaking process, and as they, with startling honestly, attempt to understand the other. With the recent earthquake and tsunami in Japan, the footage of the devastation is hauntingly familiar to the destruction of Hiroshima and Nagasaki. As Japan experiences its second nuclear crisis, Atomic Mom illustrates how we are all downwind of this story. Atomic Mom invites viewers to confront American nuclear history in a completely new way and will inspire dialogue about human rights, personal responsibility, and the possibility -– and hope -– of peace. M.T. Silvia is an independent filmmaker. Her first documentary Picardy Drive (2002, Documentary, 57min) aired on KQED’s ImageMaker series, FreeSpeechTV and airs yearly during the holidays on Oakland’s KTOP. She has worked professionally in the film industry for over twenty years at both Skywalker Sound and Pixar Animation Studios. Among many mainstream film and CD credits, she has also worked on several independent films. Join us for our annual Wild And Scenic Film Festival at the Rio Grande Theater in Las Cruces on Friday, May 13 from 6:00 PM to 8:30 PM. Reserve your ticket today by contacting Nathan or Jeff 575-527-9962 or by email at nathansmall@nmwild.org. The film fest is part of a national tour organized by the South Yuba River Citizens League, a California group that advocates for protecting rivers through Wild and Scenic status designation. The film series highlights the pressing local and regional environmental issues of today. Water Loving Doggies II – The water loving doggies are back! From 20 to 200 pounds our furry friends are sure to make a splash in your hearts in this year’s re-cut river romp, featuring music by Matisyahu. This is a guest blog by Richard D. Ellenberg, who serves as Chair of the Democratic Party of Santa Fe County. Jobs are priority one, but Gov. Susana Martínez has blocked practical jobs initiatives not fitting her national conservative image. Film credits create jobs. The governor's most visible effort was limiting these credits. The result so far: Loss of two movies budgeted at a total of $70 million. Loss of the post-production facility with 175 construction jobs and 120 permanent skilled jobs. Studies conclude that a state maximizes its benefits from films when it has a trained local labor market. Our colleges have invested in film curricula and have created that job force, just in time to lose business. The governor is attempting to break contracts with films signed prior to the film-credit reductions. She is sending the clearest message to film jobs that they are not welcome. Film credits are the only credit the governor allows to be questioned. No asking if oil and gas credits are a good investment. Oil companies are spending fortunes to find and extract oil in difficult places and not replacing supplies as fast as they use them. It would be fair to ask if their tax credits increase the number of jobs significantly. Yet the governor vetoed the bill to examine the benefit of all credits, not just film credits. Why? Politics. The film industry tends to support Democrats. The oil and gas industry tends to support Republicans. Democratic job-creation bills were dead on arrival since she would not sign them. She would not support: green job initiatives; depositing state funds in local rather than national banks to increase local lending; and a development bank based upon the successful models in other states. Nor did she have her own job-creation initiatives. One bill, passed unanimously, allowed universities to issue bonds for renewable energy improvements, creating jobs and saving money. She pocket-vetoed this initiative, with her staff saying she did not support renewable energy. She vetoed the Health Exchange Act to protect her Republican image. New Mexico would have received $1 million to work on planning for this exchange with more to follow without that veto. Now New Mexico loses those dollars and the odds that the federal government will have to step in and set up New Mexico's exchange are substantially increased. She vetoed an unemployment-tax increase supported almost unanimously to protect businesses from much higher assessments that will hurt jobs. This helps her record of not supporting tax increases, but harms our business community. This is a guest blog by Richard D. Ellenberg. It originally appeared as an op-ed in the Santa Fe New Mexican. Join us for our annual Wild And Scenic Film Festival at the Guild Cinema in Albuquerque on Saturday, April 23, from 1:00 PM to 3:15 PM. The film fest is part of a national tour organized by the South Yuba River Citizens League, a California group that advocates for protecting rivers through Wild and Scenic status designation.The film series highlights the pressing local and regional environmental issues of today. Tickets are $10 adults/$5 students. Kids free. Tickets are available at La Montanita Co-op in Nob Hill (3500 Central SE) OR reserve will-call tickets by calling Roger at 505-843-8696 x104. From Lora Lucero: The new documentary film The Economics of Happiness will be screened at the UNM Lobo Theatre, Student Union Building Room 1003 (basement of the SUB) on Monday, March 28, at 6:30 PM. Admission is free and open to the public. Going beyond merely identifying the myriad problems of corporate globalization, The Economics of Happiness, co-directed by Right Livelihood Award winner (aka, the “alternative Nobel Prize") Helena Norberg-Hodge, explores the rapidly growing movement of localized economies around the world that offer a strategic solution that can solve our most serious economic, social, environmental and cultural crises. “Going local” is a powerful strategy to help repair our fractured world -- our ecosystems, our societies and ourselves. The Economics of Happiness spells out the policy changes needed to enable local businesses to survive and prosper. From urban gardens in Detroit, Michigan to the Transition Town movement in Totnes, UK; hands-on education in Yokahama, Japan; community-centered agriculture in Ladakh, Tibet; calculating the social costs of economic growth in Thailand; and small-scale peasant farming in Peru, people around the globe are going local to solve the myriad of crises we face as a planetary community. The Economics of Happiness features the acclaimed environmentalists, scholars and authors Vandana Shiva, Bill McKibben, David Korten, Juliet Schor, Richard Heinberg, accomplished Bhutanese film director Khyentse Norbu and the first Prime Minister of the Tibetan Government-in-Exile Samdhong Rinpoche among others. The screening is cosponsored by: The New Economy Book Club, Economic Reform Advocacy (ERA!) Group, S.O.A.P. 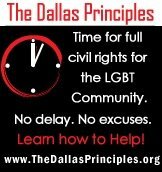 (Students Organizing Actions for Peace), 50+ Cohousing, and others. It is part of the People Before Profit film series, which aims to increase awareness of social issues and encourage students to think about local and global problems and solutions. The series started last fall and continues this semester with free weekly film screenings and discussions on Mondays at 6:30 PM.